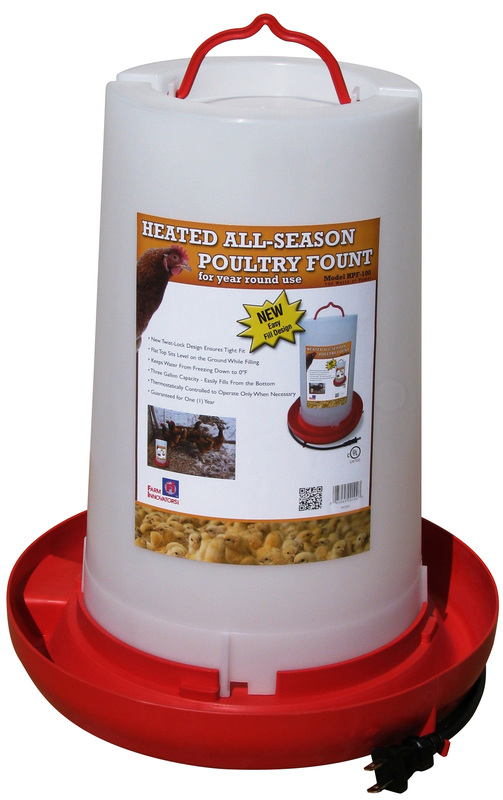 This plastic waterer has a built-in thermostatically controlled 100 watt heater, making this waterer suitable for all seasons. It will hold 3 gallons of water. Cord plugs into your own extension cord. Updated version of this waterer: Base has higher wall for greater stability in holding the fount in the base. It also now has a 2' cord and a hook on the base to hold the cord. Fills from the bottom. Use this item only in a dry sheltered area. Explain how you fill from the bottom. This unit has a fill plug underneath the base. Once filled, you would flip the unit upright. Should I keep this plugged in all night to keep it from freezing? I am worried about the cost of keeping it plugged in all night. You would keep the waterer plugged in all the time. It is thermostatically controlled so will only be turning on when needed. We only have one size of heated waterers available. I have the heated poultry waterer and my friend decided he would punch a whole in the top of the water holder in hopes of putting in water from the top. It didn't work, the top is destroyed and I need to replace it. The heater trough works well. Can I just get the 3 gallon water top? Sorry, we do not have extra founts available for replacement. It comes as a complete unit. newer version much worsethese are the differences between the new and older version. The hanger is now plastic and not metal, based on how it's attached it won't take long with the weight for this to break. It's smaller now, not as much capacity. The water is sealed in by a plug, and after frequent use I can see this start to leak shortly. The cord is much shorter and will have to use an extension cord to reach an outlet. All these cutbacks yet the price didn't drop any.